The ruling Bharatiya Janata Party (BJP) has an unenviable problem reflected in its manifesto released on Monday. It claims that in five years of Prime Minister Narendra Modi’s rule, virtually everything has been done. But it has to promise the people something in order to win their votes again. So, what do you promise if you have already achieved everything? Or, more importantly, how do you win over disappointed people if you are not willing to admit that you failed? The BJP manifesto is full of all the usual numbers about beneficiaries of various schemes, “ease of doing business” rankings, kilometres of highways built and so on. These are currently being drummed into the people’s heads endlessly on television and radio. Dozens of studies and ground reports have shown that these claims are exaggerated. In any case, if people had benefitted, they wouldn’t need so much persuasion. Unbelievably, apart from saying that “We are committed to ensure benefits of constitutional provisions of the Scheduled Castes, Scheduled Tribes and backward classes” the BJP and Modi government have nothing to say on rising atrocities on dalits and adivasis, the declining job opportunities due to privatisation, and the series of judicial or executive acts of commission or omission that restricted the basic rights of these most oppressed communities. In fact, social justice is not mentioned even once in the whole manifesto. The mention of Scheduled Castes at one place is clubbed with the 10% reservation for economically weaker sections, almost as if they were feeling shy of addressing the burning issue of caste oppression. Coming in the context of the past five years when dozens of Dalit youth were lynched for transporting cattle or handling their carcasses, when countrywide protests ignited after the Supreme Court diluted the sole law for protection against atrocities, when social injustice in higher education centres was glaringly highlighted by the suicide of Rohith Vemula and when dalit youth unemployment is raging – this omission is not just an admission of failure. It is tantamount to a confession by the BJP that it is not really concerned about dalits, or with caste oppression. Surveys have been consistently showing that unemployment (or under-employment) is the single biggest worry of voters across the country. This is unsurprising – joblessness is running at a 45-year-high and among educated youth it is at an all-time high. Modi, infamously, promised one crore jobs every year while seeking votes in the 2014 election campaign. Yet, the BJP’s 2019 manifesto clumsily glides over this incendiary crisis. While talking about the economy, there is no mention of jobs. While talking about youth, it says that BJP will create “new opportunities of employment by providing more support to the 22 major 'Champion Sectors' identified as the main drivers of Indian economy”; while talking about women, it says BJP will “encourage industries and corporates to generate better employment opportunities for women”; and so on. Besides assuring that more MUDRA loans will be given to entrepreneurs, or that they will make all efforts that “our aspirational middle class” gets access to better employment opportunities, the BJP manifesto has nothing to offer. They seem to be afraid of giving any promise after the disaster of Modi’s one crore jobs promise – or they think that Modi has solved the jobs crisis! Remember the 2014 campaign promise of bringing back black money from abroad? Remember demonetisation, which was supposed to kill all black money? Remember ‘chowkidar’ Modi who promised to protect the treasury? All that is gone now, except the bizarre moniker chowkidar which prefixes the Twitter handles of Modi and his senior party colleagues. The 2019 manifesto has a small section on corruption-free India which ironically boasts of enacting the Economic Fugitives Act — when leading bank fraudsters like Vijay Mallya and Nirav Modi, along with some 40 others, are happily settled abroad. It mentions a few other measures and, that’s it. The real BJP thinking is revealed in the open letter to 130 crore Indians penned by Modi himself that precedes the text of the manifesto. Talking about corruption, he writes that middlemen no longer roam the corridors of power and – note this – 8 crore fake beneficiaries have been eliminated by Aadhaar and Jan Dhan. That corruption and cronyism have become rampant is evident from Rafale and various Adani sweet deals, but using a patently false figure of fake beneficiaries as an example of corruption? Does Modi know that 56 people have starved to death in the country, out of which at least 25 were due to Aadhaar non-compliance issues? For Modi, this is what the fight against corruption got reduced to. This is one issue on which the manifesto writes prolifically but all based on either falsehoods or wild promises. It makes the usual claim that minimum crop prices have now been raised to 1.5 times the production cost, something that the BJP promised in 2014. This has been shown to be a brazen falsehood. What they have done is to fiddle with the calculation by using a lower production cost (leaving out rent and interest costs). As a result, even today farmers are deeply discontented. In fact, that is why the PM KISAN scheme of income support to small and marginal farmers was launched by the beleaguered BJP weeks before the general elections were announced! The lynchpin of BJP’s agricultural agenda is another tired jumla – doubling farmers’ income. In the face of an all-pervading agrarian crisis, with crop prices falling, wages of agri-workers declining and input prices going up, farm incomes have stagnated. Yet, the Modi government continues to pose the doubling promise, as if it will reassure farmers. In addition, BJP has thrown in a whole lot of wild promises like infusion of Rs. 25 lakh crore in the sector, giving pensions to all 12.5 crore small and marginal farmers, extending the PM KISAN scheme to all farmers and interest-free loans for five years. Why they did not do these things in the five years gone by is something that farmers are bound to ask? 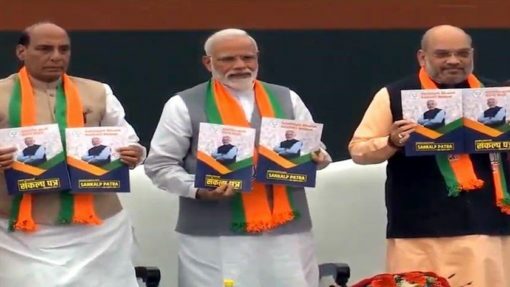 It is de rigueur for any BJP manifesto to repeat a set of assertions for pleasing its mentor, the Rashtriya Swayamsevak Sangh (RSS), and hoping that the BJP’s fundamentalist base doesn’t get alienated. These assertions – building of Ram Mandir at Ayodhya, Uniform Civil Code, abrogation of Article 370 and annulling Article 35 A – are all there this time round too. In addition, the manifesto has added that the Citizenship Amendment Bill will be brought back and that the Sabrimala issue will be properly contested in the Supreme Court and that they will “secure constitutional protection on issues related to faith and belief”. Can this hodgepodge of paralysed thinking and regressive ideology secure BJP a victory in the coming elections?